We are one of the recognized Suppliers of a wide array of Dairy Equipments. Procured from the most reliable vendors or manufacturers, our Dairy Equipments are appreciated for superb performance and durability. Our range encompasses skid mounted pasteurization, road milk tankers, milk storage tanks, sight glass accessories, valves, chilling plants, level indicators, heavy duty machining and conveyors, etc. 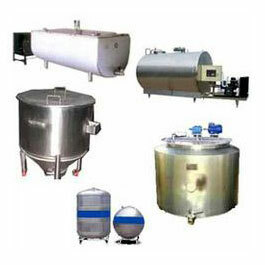 We make available these Dairy Equipments at very competitive rates.